Safety Turtle helps to protect your children. Safety Turtle is the only safety device that protects your children from water accidents by sounding an alarm the instant he or she falls or ventures into the water. 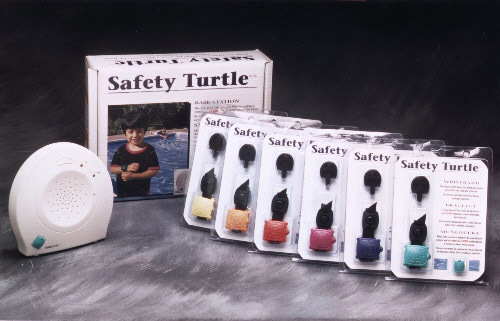 Safety Turtle is an effective "last line of defense" to protect your children. Simply place the Turtle wristband around your child's wrist. If he or she falls into the water, a loud alarm will sound at the Base Station. The Base Station should be placed inside the house, within 100 feet (30 meters) of the pool. Turtle wristbands are avaiable in six attractive colors. Any number of Turtles of the same color can be used with one Base Station. For buying convenience, the Turtle wristbands and the Base Station are packaged separately. Please be aware that Safety Turtle is not suitable for use in sea water and its effectiveness in pools decreases when salt content exceeds 4000 ppm.